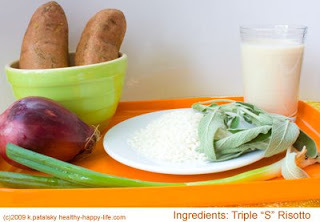 I refer to this recipe as my Triple "S" Risotto: Sweet Potato, Scallion and Sage. 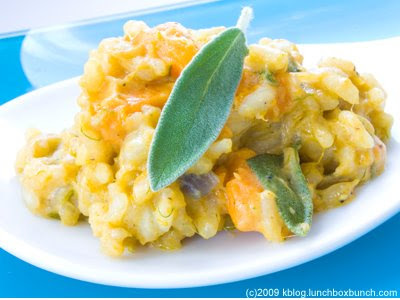 It is a bit creamier and bolder than a traditional risotto. The scallions, sweet potatoes, garlic salt and hint of cayenne really pump up the flavor. This is comfort risotto all the way. Plus it's healthy due to the generous amounts of copper, manganese, B vitamins, vitamin K, and Vitamin A in the ingredients. 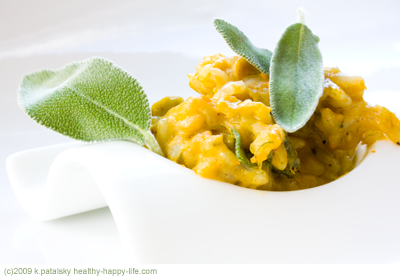 This recipe is inspired by one of my favorite restaurant dishes here in New York, the Butternut Squash Risotto at GoBo restaurant. 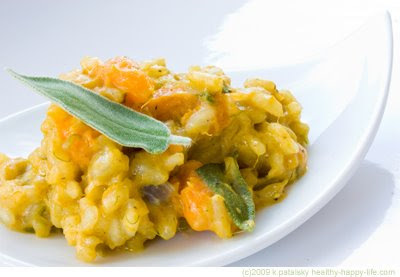 I quickly because addicted to GoBo's sweet and savory dish of perfectly cooked Arborio rice and thick chunks of butternut squash, garnished with a hint of raw sweet sage. I decided that I had to learn how to make this dish myself. So I did. Then I twisted it up a bit to really make it my own. This recipe is the end result. Risotto is a dish that any skilled chef can conquer. However, it might take a newbie chef a few tries to get it right. It is a tricky, high intensity dish to cook. You must stand over the sauce pan and stir the rice nonstop for about 30 minutes. I call it 'meditation cooking'. You basically zone out watching the rice slowly absorb all the liquid and then get 'thirsty' for more liquid until the desired texture and consistency is achieved. And just when you think the risotto is done, you find it could probably go for another round. 1. Wash scallions. Chop onion and scallions. Set aside. 2. Bake or steam sweet potatoes (20 minutes in oven or 2 minutes in microwave.) Should be slightly firm - not too mushy. Peel skin and dice potatoes into large 1" cubes. Divide into two portions. Set aside. 3. Roughly chop sage leaves into dime-sized bits. Keep 2-3 leaves whole, for garnish. 1. Heat olive oil and 3 Tbsp. water in saucepan over medium heat. Add a dash of garlic salt, red onion, most of the scallions, a few bits of chopped sage and half of the portion of sweet potato cubes. Saute for 3-5 minutes, until liquid is absorbed. 2. Add rice, remaining salt, cayenne, bay leaf and a bit more sage. Cook one minute, or until rice is slightly translucent, stirring constantly. Turn up heat to medium high. 3. Add 1/2 cup soy milk and cook until absorbed, stirring constantly. 4. Add 1/2 cup water. Stir until absorbed. Repeat this process (alternate water and soy milk). Do not add next portion of liquid until all the previous liquid is absorbed. YOU MUST STIR AND FOLD THE RICE MIXTURE CONSTANTLY. Estimated time of stirring while adding liquid: 25-35 minutes. Tip: Remove bay leaf half way through this process. You don't want the bay leaf to overpower the sage. 5. When all the liquid has been added and absorbed your consistency should be that of a very thick oatmeal. If is seems too mushy, stir it quickly over the heat until it firms up. Be sure to taste test the rice firmness. If the inner grain is still hard-go for another round of liquid. 6. Once the texture and consistency is perfect, turn the heat to low and add remaining sweet potatoes, sage leaves and scallions. Fold over a few times. Turn heat off and cover with foil. Let sit for two minutes. 7. Serve in a warm shallow soup bowl or a small appetizer plate. Garnish with fresh sage and ground pepper. Drizzle a bit of olive oil for a richer dish. PAIRING TIP: Pair this dish with a Boston lettuce and sliced pear salad. Top salad with a vegan lemon-mayo dressing. Mix very well and drizzle over fresh greens. Olive oil is a natural juice which preserves the taste, aroma, vitamins and properties of the olive fruit. Olive oil is the only vegetable oil that can be consumed as it is - freshly pressed from the fruit. Choose extra virgin olive oil for the most health benefits-its processing is minimal and maintains the most nutritional elements such as vitamin E and phenols. 120 calories per tablespoon. 14 grams fat, 2 grams saturated fats, 12 grams healthy fats, 0 mg cholesterol, 0 mg sodium. Olive oil is high in monounsaturated fats and antioxidants. Studies have shown that EVOO (extra virgin olive oil) assists in raising HDL (good) cholesterol levels, and reducing LDL (bad) cholesterol levels. Olive oil is the healthiest oil available. A less discussed benefit of olive oil, is its positive effects on the lining of the stomach. Olive oil's protective function has a beneficial effect on ulcers and gastritis. Olive oil activates the secretion of bile and pancreatic hormones Naturally, and thus it lowers the incidence of gallstone formation. read the benefits of spicy foods like cayenne.